Now, early in the session, the New Hampshire Senate has passed SB 12-FN. It had five Senators as sponsors, Senators Abard, Birdsell, Carson, Daniels, and Gannon. It passed the Senate with a healthy 13 to 10 margin, defeating two attempts at amendment, on January 19, 2017. In 2016, the New Hampshire House passed the Constitutional carry bill 206 to 146. New Hampshire is bordered on the East by Maine and on the West by Vermont. Both of those states have Constitutional carry. New Hampshire’s requirement for a carry permit was passed about a hundred years ago as “progressive” ideas swept the nation. Those laws are being repealed as evidence accumulates that they did more harm than good. Opponents say that they are an infringement on Second Amendment rights. In January, 2016, the bill passed the House 206 to 146. Republicans voted for the bill, Democrats against. Sununu is not a gun owner but said he would sign a bill doing away with the need for concealed carry permits. 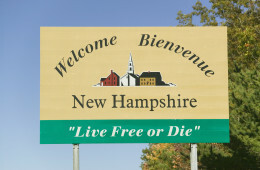 It is likely that New Hampshire will become the first state to move to permitless or “Constitutional carry” in 2017. As with the other 10 states that have moved to Constitutional carry, the state shall issue permit system will remain in place for the convenience of the armed public. Permits are useful for reciprocity with other states. Half of the states in the Union allow carry permits as an alternate to the NICS instant check system. New Hampshire is not one of those states. Editor’s Note: The New England Revolution continues. As NH joins Vermont and Maine in acknowledging Constitutional Carry, New England has been literally split in half between the freedom loving north and the oppressive rights infringing south. On a personal note, I enjoy lobster and can only dream of the day that I can ride from Pittsburgh to Portland (Maine) with my rights intact for the entire trip. Only Cuomo’s regime in New York stands in my way and hopefully like all oppressive tyrannical regimes, it too will fall to liberty.